Bahrain’s efforts to build national reconciliation after it crushed street protests in 2011 have stalled, and the Western ally in the Gulf has not implemented recommendations to protect freedom of expression, including nonviolent dissent, according to a U.S. State Department report obtained by Reuters. The report, which was delayed for months, appears to represent muted criticism of a strategically-located country that hosts the U.S. Navy’s Fifth Fleet as a bulwark against Iran. The human rights record of Bahrain, where a Shi’ite majority is ruled by a Sunni monarchy, has been criticized by the United States, Britain and rights groups. 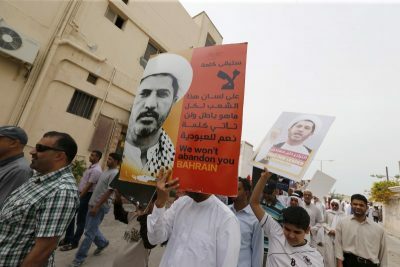 In a series of moves over the past three weeks, authorities closed down the main Shi’ite opposition al-Wefaq Islamic Society, doubled the prison sentence on the group’s leader, Sheikh Ali Salman, detained prominent rights campaigner Nabeel Rajab and stripped Ayatollah Isa Qassim, Bahrain’s Shi’ite spiritual leader, of his citizenship. Bahraini Shi’ites complain of discrimination by the government, which in 2011 put down a pro-reform uprising. Since then, protesters have clashed almost daily with security forces, who have been targeted by several bomb attacks. Bahrain has accused the opposition of undermining security and blamed the bombings on Iran and the armed Shi’ite group Hezbollah in Lebanon, both of which have strongly condemned the moves against Ayatollah Qassim. Washington has said it was “alarmed” by the move against Qassim and the United Nations called it “clearly unjustified” under international law. It was not immediately clear whether the department’s report on Bahrain was completed before the most recent events. “While there have been some positive reforms in Bahrain, they are dwarfed by a pattern of torturing prisoners and by recent government actions to silence opposition political leaders, to persecute human rights defenders, and to revoke the citizenship of a leading cleric,” Sen. Patrick Leahy, reacting to the report, said in a statement emailed to Reuters. “These abuses further limit what few remaining opportunities exist for peaceful dissent in that country,” Leahy told Reuters. Bahrain’s government did not immediately respond to a request for comment. Secretary of State John Kerry spoke about the report with Bahrain’s foreign minister on Wednesday, and urged Bahrain to make necessary reforms, spokesman John Kirby said. The report gauges Bahrain’s implementation of recommendations made by the Bahrain Independent Commission of Inquiry. The commission was established to investigate the events of February and March 2011, when authorities, with help from Saudi Arabia, crushed an uprising by Shi’ites demanding a bigger role in running the country. The report cites numerous steps it says Bahrain’s government has taken, including rebuilding demolished mosques, investigating claims of torture, training security forces in human rights and providing protections for detainees. But in some areas, Bahrain has interpreted the commission’s recommendations narrowly, the State Department said. Brian Dooley a director at the nonprofit group Human Rights First criticized the report. “Releasing such a tepid criticism in the middle of the most ferocious crackdown against opposition and human rights leaders in five years leaves the State Department, again, looking like it can’t face the reality of Bahrain’s mess,” Dooley said. But Thomas Krajeski, the U.S. ambassador to Bahrain from 2011-14, said the report would never be satisfactory to all parties. “An impossible task burdened with imprecise statistics, conflicting reports and political baggage. No one will be happy with whatever the final report says,” he told Reuters. Last year Washington lifted holds on security assistance to the Bahrain Defense Force and National Guard that were put in place after Bahrain’s crackdown on the demonstrations in 2011. The report was approved by, among other senior State Department officials, Tom Malinowski, the U.S. Assistant Secretary of State for Democracy, Human Rights, and Labor. During a visit to Bahrain in 2014, Malinowski was declared persona non grata after Manama said he had “intervened flagrantly” in the country’s internal affairs. Malinowski had met with Ali Salman, the now-jailed leader of the opposition Wefaq party. Malinowski also returned for a visit to the country some months later. Next post Is Pombe Magufuli of Tanzania a threat to Kenya?